Teachers struggle every day to bring quality instruction to their students. Beset by lists of content standards and accompanying “high-stakes” accountability tests, many educators sense that both teaching and learning have been redirected in ways that are potentially impoverishing for those who teach and those who learn. Educators need a model that acknowledges the centrality of standards but also ensures that students truly understand content and can apply it in meaningful ways. For many educators, Understanding by Design addresses that need. Simultaneously, teachers find it increasingly difficult to ignore the diversity of the learners who populate their classrooms. Few teachers find their work effective or satisfying when they simply “serve up” a curriculum--even an elegant one--to students with no regard for their varied learning needs. For many educators, Differentiated Instruction offers a framework for addressing learner variance as a critical component of instructional planning. In this book the two models converge, providing readers fresh perspectives on two of the greatest contemporary challenges for educators: crafting powerful curriculum in a standards-dominated era and ensuring academic success for the full spectrum of learners. Each model strengthens the other. Understanding by Design is predominantly a curriculum design model that focuses on what we teach. Differentiated Instruction focuses on whom we teach, where we teach, and how we teach. Carol Ann Tomlinson and Jay McTighe show you how to use the principles of backward design and differentiation together to craft lesson plans that will teach essential knowledge and skills for the full spectrum of learners. Connecting content and kids in meaningful ways is what teachers strive to do every day. 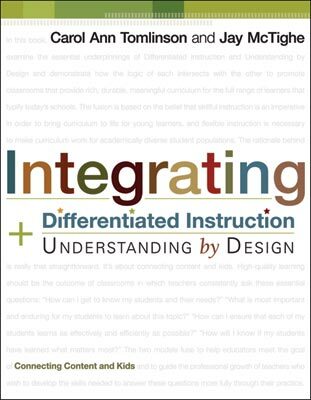 In tandem, UbD and DI help educators meet that goal by providing structures, tools, and guidance for developing curriculum and instruction that bring to students the best of what we know about effective teaching and learning. Premium members get the print book. Premium Online members get the e-book. CAROL ANN TOMLINSON career bridges both practice and scholarship in education. She was a classroom teacher for 21 years, teaching at the high school, middle school, and primary levels. She was instrumental in developing a language arts program designed to effectively serve a full spectrum of learners in heterogeneous middle grades classrooms. The program was piloted and funded by the Commonwealth of Virginia and demonstrated positive achievement gains for a full range of learners in such settings. JAY MCTIGHE brings a wealth of experience developed during a rich and varied career in education. He served as director of the Maryland Assessment Consortium, a state collaboration of school districts working together to develop and share formative performance assessments. Prior to this position, McTighe was involved with school improvement projects at the Maryland State Department of Education. He is known for his work with thinking skills, having coordinated statewide efforts to develop instructional strategies, curriculum models, and assessment procedures for improving the quality of student thinking.